One of the great tragedies of the modern world is the general American understanding of capitalism, or lack there of. When America was founded the capitalist system as we know it did not yet exist. Modern capitalism would not develop in America until after the Civil War, when America's Industrial Revolution took shape. When America was founded, however, it was home to some of the world's foremost economic thinkers, such as Alexander Hamilton. Europe, of course, also played host to a great number of economic thinkers as well, including the "father of modern economics", Adam Smith, but it was America that eventually took center stage in the world as the "bastion of capitalism." In 1776, the same year that America launched its war for independence, Adam Smith published his masterpiece, An Inquiry into the Nature and Causes of the Wealth of Nations; a work that set the ideological foundation for the development of capitalist economy. American understanding of capitalism today is in many ways very different from the teachings of the man who we consider to be the father of the very economic ideology which this country espouses to champion. Understanding capitalism requires a strict understanding of the importance of property ownership in the capitalist system. Property ownership is the core of the capitalist system. Capital is productive property. Capital is property that has some productive economic value. Your television at home is not "capital", however it can be capital if you use that television set in a way to earn money, for example if you used it to give a paid presentation to an audience. The stock that is laid out in a house, if it is to be the dwelling-house of the proprietor, ceases from that moment to serve in the function of a capital, or to afford any revenue to its owner. A dwelling-house, as such, contributes nothing to the revenue of its inhabitant; and though it is, no doubt, extremely useful to him, it is as his clothes and household furniture are useful to him, which, however, makes a part of his expense, and not of his revenue. So, the first thing to understand is that capitalism revolves around "capital", i.e. productive property. The next thing to understand is that a capitalist is someone who receives money through the ownership of capital, i.e. someone who receives money through the ownership of property. A more useful description of the word capitalist would be someone whose primary means of income is through the ownership of property. In other words, someone like Donald Trump is a true capitalist. He makes money through the buying, using, and selling of property. His primary form of income is not a salary; his primary means of income is not labor. A factory owner or a professional investor is a capitalist. An average citizen in America today may own some stock, which is a form of capital, but they have essentially no control over the property that the stock represents and the stock is not a primary means of income, therefore simply owning some does not make one a "capitalist." In a capitalist system property ownership is ultimately the only way in which value is "realized". Ownership of property grants the owner of the property full rights to all of the value of that property. That is, at its core, what capitalism is about, the ownership of rights to value. At the same time, labor is the only means by which value is created. "Labor" can include work done by people, by nature, or by machines, but nevertheless, the only thing that actually creates new value is doing work. This is the key first step in understanding capitalism. If you own something then you own full rights to all of the value of that thing.This means, for example, that if I own a piece of metal, and I get someone to sculpt that metal into a statue, I, through my property rights, am still entitled to the full value of the statue because I own the property. The person who took the block of metal and performed work on it to increase its value is not entitled to anything. He has no legal claim to any of the value of the object at all, even though he is the one responsible for increasing the value of the item. In fact, all of the "added value" as a result of labor is obviously a product of the worker. In this type of system the property owner may pay a wage to someone to perform work on his or her property in the hopes that the work performed will increase the value of the property. In this case a capitalist may go to the public and offer a fee, of say $100, to anyone who will perform the work that he or she is requesting. Someone may take this offer and agree to perform the work. The worker, of course, still has no rights to any of the value of the property, the capitalist retains full rights and just agrees to pay the wage to have the work done. Whatever value results from the work being done is fully owned by the capitalist. If he pays the worker $100 and the result is a product that is worth $5,000, then the worker has no legal claim to anything other than the $100 which he originally agree to do the work for. Though the manufacturer has his wages advanced to him by his master, he, in reality, costs him no expense, the value of those wages being generally restored, together with a profit, in the improved value of the subject upon which his labor is bestowed. Wage-labor, and hence labor markets, are a defining feature of capitalism. That's all pretty basic and easy to understand, so now lets go to the next step. All value in the economic system is ultimately realized through property ownership. This means that everything that is done which increases value in our economy is realized through property rights. Let's take a look at how this works in our economy. Land is a good way to demonstrate this concept. The value of land is affected by many things, but not always by work done to the property itself. You can buy a piece of land, do absolutely nothing to it, and its value will change based on "the market". Things which may impact the value of the land are: development near the land, changes in population, change in the value of resources that are present on the land, etc. Let's say that Jim bought 10 acres of land out in the country in 1970 for $5,000. After buying the land a highway was built that runs near the land. Over the years more and more development takes place near the land. Now in 2003, because of the fact that roads and neighborhoods and stores have been built up near the land, the value of the land has increased. The 10 acres are now worth $1,000,000. Jim is now entitled to the full value of the property because of our property right laws. However Jim did not cause the value of the property to rise. Jim did not work to create this value. The value of the property was not enhanced by Jim, but instead it was enhanced by the people who built the roads and houses and stores near his property. Had the highway not been built near his property and had growth not taken place near his property and had the population not increased, then his property would not have changed in value in this manner. The value increase of his property was not Jim's creation; the increase in value was a product of society. Society is who enhanced the value of the property; Jim is the person who retained legal right to that value which was created by other people. Of course had a city dump been built next to his property the value may have gone down, but the point is the same, property rights are the means through which socially created value is realized in a capitalist system. The property owner may or may not be a contributor to the change in value of the property, and the extent to which the property owner is responsible for the change in value varies infinitely from case to case. This concept applies to all "property," which is to say everything that can legally be owned, from land to cars to factories to public buildings to music to patents, etc. In the case of public property the State (in theory the citizens) is the owner of the property, but all the same principles apply. Now, let's expand this concept. We are often taught that our economic system works through a system of exchanges between individuals and that these exchanges are by definition fair because they are agreed upon by both parties. We are also taught that these exchanges represent the full expression of value in our system, with the impression that capitalists and laborers, i.e. property owners and those that they employ, are on equal footing. In reality there are an infinite number of factors that contribute to our economy, and not all of those factors are even a part of the labor system, in fact not all of those factors are even a part of human society. In addition to that, capitalists and laborers are not on equal footing. The value of property can be impacted by environmental conditions, such as climate, plant growth, water flow and quality, pollution, etc. If you owned a store in a town and the climate changed and the water in the region dried up so that the area became a desert, then the value of the property you owned would be negatively impacted. The fact that animals grow, plants grow, etc, all has an impact on value of property, not just land, but all things: cars, clothes, sporting equipment, music, factories, farms, etc. For example, fishing equipment is increasingly popular because people enjoy the sport of fishing. The sport fishing industry is impacted economically by the number and quality of fish that live in a region. If a place has a lot of large fish that are fun to catch then the value of fishing equipment is going to be higher. If all the fish go extinct then fishing equipment has no value. So in this way we can see that the fact that fish are out there in the wild breeding, living, surviving, and doing whatever it is that they do, has an impact on the value of property related to catching fish. In a way you could consider the fish to be working for members of the fishing industry, however the fish, of course, get no compensation. Thus, capitalists who own fishing related industry, such as factories that produce fishing rods, are in fact able to realize value added by these fish. The fish are actually responsible to a large degree for the value of the property, not just the workers who make the rods or the owners who own the business, etc. So, we can see that many things contribute to value, not just paid labor. Now, back to humans and our society. Virtually every single thing that every person does impacts the value of property in some way. When I choose to pick up trash on the sidewalk I am doing work that has an economic result. The neighborhood, be it a business district or residential, is having its property value maintained, restored, or increased. We all know this. People prefer shop in a nice clean places, so in an area that is well-kept business owners are going to be able to get higher prices for their goods and services than in an area that looks like a dump. The clothes I choose to wear, if I choose to take a bath and stay clean, if I keep my yard clean, if I help a person across the street, all of that contributes to value in our economy. All of that value is realized through property rights. The most blatant example of this is the occupation of being a homemaker. A woman, or man, who chooses to stay home and raise children and possibly volunteer for activities at schools and things of that nature, is doing a lot of work that adds value to our total economic system. However, they are not compensated for their work monetarily. What is important to understand though is that someone is. Again, all value-added is realized at some point. Virtually every single action that every person, animal, plant, and inanimate object does has some impact on value. All of these things, positive or negative, are realized through property rights. This means that while a homemaker stays home and cares for his or her child and volunteers in the community they are not being compensated, but that work does have an impact, and that impact is realized by the property owners in his or her community, and in theory that concept of community can be extended to include the entire world. It means that we have two types of value-added in our system, value-added that is compensated for and value-added which is not compensated for. All of the value-added, including that which is not compensated for, is realized by property owners through property rights. It means that all socially created value is realized by property owners. It means that wages are an insufficient means of redistribution of value for the contributions made by society. It means that property owners are the sole monetary beneficiaries of socially created value. In biology our understanding of ecosystems started out with the "food chain", but then biologists began to realize that a "chain" of relationships really does not adequately describe an ecosystem. We then moved on to the food pyramid model, but again this model, while better than the food chain model, proved insufficient to describe an ecosystem. We then arrived at the food web model, which is where we are at today, and the same is true of an economic system as is true of an ecosystem. Our economy is comprised of a web of relationships. Everything influences others things, and these relationship cross national boundaries as well. The level of education of the population in India has an impact on the American labor markets and on the price of goods and services in America and on the value of property in America, and the same can be said of just about everything in the world. The situation with the Rain Forests in Brazil impacts the price of wood and food in America, etc. So we can see that our global economy is indeed a web like structure of relationships where local conditions are both impacted by foreign conditions and also serve to impact foreign conditions. Likewise, it is important to understand the economy web in a more direct manner. Though the term "self-made millionaire" is a common one, there is no such thing as a "self-made" millionaire, or a "self-made" anyone of any economic level. The only person who can be called self-made is a hermit. For example if a person starts their own pizza delivery business and then makes it successful and becomes a millionaire, many will call him "self-made," but in fact he is not "self-made" any more than a shark living in the ocean is "self-made". Both are part of a web of relationships that has to exist in order to support the individual. In order for the man to have a successful pizza business he relies on established roads, an educated public from which he can employ workers, consumers who have money to pay for the pizza, farmers who grow and market the food, etc. This is the full nature of the economy web. What we have to understand about capitalism is that a relatively small number of people in the world own capital. At the same time, the only people in the world who actually have a stake in the value of our system are those people who do own capital. We all, every single living thing on earth, contribute to the value of our economy, but owners of capital are the ones who realize all of that value. Some of that value is paid back to workers in the form of wages, but a large portion of that value is not the product of paid labor, or even in cases where it is, for example a worker who builds a road, the "trickle down" effects of that labor are not compensated for, i.e. the worker is paid a wage to build the road, but he is not paid for the real value that he added to the other property near the road. In that case the property owner reaps the reward of all of the work done by the laborer, and the investments made by the public, and assumes none of the cost. This of course presents a problem when it comes to the issue of economic justice. Over the past 20 or 30 years in America ownership of capital has been consolidated into a smaller number of hands. Companies are consolidating and a smaller portion of people are owning a larger and larger portion of American capital. This is not the first time in American history that this situation has arisen, this took place at the turn of the 20th century as well, with a few wealthy capitalists such as JP Morgan, John Rockefeller, and Andrew Carnegie owning or controlling hugely significant portions of American capital. Not only did those conditions help contribute to the Great Depression, but the fact is, the conditions are simply not fair. Capitalists, by definition, are taking advantage of work that other people do, and they are, through law, being entitled to the value added to property by other people. You buy property, you get a piece of paper that gives you rights to "ownership" of all of the value that that property represents, and then as the value of that property changes due to work done by society, you are legally entitled to all of that value. This is certainly not to say that capitalists don't serve a valuable role in the economy, they do. That situation alone presents a problem though, however, its not a problem that cannot be dealt with within the capitalist framework, but it is a problem that must be recognized. There is a "trickle" effect in a capitalist economy, but unlike the claims of the Reagan Administration, wealth does not trickle down, it trickles up. As the graph below shows, in 2001 the top 1% possessed almost 33 % of the nation's wealth, while the bottom 50% owned less than 3%. The source data, which comes from the Federal Reserve's Survey of Consumer Finances, is linked below. All of the little things that contribute to the economy are realized by property owners, and property ownership is concentrated in the hands of a relative few. This is something that we all ultimately understand I think, we just don't all step back to get the big picture. The more property you own, ultimately the better off you are, because the more property you own the more you are taking advantage of the fruits of society. The easier you have it, because society is doing more and more work for you. That's obviously why home ownership is seen as such an important part of preserving the American dream, but what people in America don't think about as much is ownership of productive property, i.e. capital. In addition, the thing about property is that it takes money to buy property, so the more money you have the more property you can buy. As Adam Smith says in The Wealth of Nations: "Money, says the proverb, makes money. When you have got a little, it is often easy to get more. The great difficulty is to get that little." It is essentially a system that requires money in order to make money and the more you have the more you are able to acquire, which is why property ownership is being increasingly consolidated, yet, in truth every person in the country is already contributing to property value. We are all contributing, but only those who own the property are truly reaping the reward. As I said, there is a "trickle" effect that does take place in an economy, and property is like the bucket that catches the water drops. Property ownership is essentially the right to all of the water in the bucket. So, in this case, we have a system in which people, plants, animals, and other environmental conditions are casting drops of "value" into these buckets. In some cases a person may be doing this through paid labor, for which they are compensated. You may make and agreement with the bucket owner to cast 50 drops of value into the bucket for a fee, however you also cast other drops of value into the bucket outside of that labor contract as well, and so does every person in the country, and ultimately the world. There are also a few cases of people who take value from the bucket too, but let's first focus on the value going into the bucket. So let's say then that 80% of the value being cast into the bucket is in the form of paid labor, value that is compensated for. The other 20% of the value cast into the bucket is never compensated for, that is just "free value" that the bucket owner keeps outright. Each little thing we do casts drops of value into the buckets of capital, and the combined effect of everyone in the community, ultimately the world, casting little drops of value into the buckets of capital results is a major acquisition of uncompensated value by property owners, "capitalists". This is one reason that concentrated ownership of capital is not only detrimental to society, but in fact quantifiably unjust. It is a form of theft of socially created value. Any value that property has that the owner of that property did not employ someone to create is value that was created by society without compensation. In a country which had acquired that full complement of riches which the nature of its soil and climate, and its situation with respect to other countries allowed it to acquire; which could, therefore, advance no further, and which was not going backwards, both the wages of labor and the profits of stock would probably be very low. In a country fully peopled in proportion to what either its territory could maintain or its stock employ, the competition for employment would necessarily be so great as to reduce the wages of labor to what was barely sufficient to keep up the number of laborers, and, the country being already fully peopled, that number could never be augmented. In a country fully stocked in proportion to all the business it had to transact, as great a quantity of stock would be employed in every particular branch as the nature and extent of the trade would admit. The competition, therefore, would everywhere be as great, and consequently the ordinary profit as low as possible. But perhaps no country has ever yet arrived at this degree of opulence. China seems to have been long stationary, and had probably long ago acquired that full complement of riches which is consistent with the nature of its laws and institutions. But this complement may be much inferior to what, with other laws and institutions, the nature of its soil, climate, and situation might admit of. A country which neglects or despises foreign commerce, and which admits the vessels of foreign nations into one or two of its ports only, cannot transact the same quantity of business which it might do with different laws and institutions. In a country too, where, though the rich or the owners of large capitals enjoy a good deal of security, the poor or the owners of small capitals enjoy scarce any, but are liable, under the pretence of justice, to be pillaged and plundered at any time by the inferior mandarins (mandarins is a negative word for government officials), the quantity of stock employed in all the different branches of business transacted within it, can never be equal to what the nature and extent of that business might admit. In every different branch, the oppression of the poor must establish the monopoly of the rich, who, by engrossing the whole trade to themselves, will be able to make very large profits. Now, arguably, this is a condition which America may be starting to face today. This is a condition that has always been understood to be a condition of market systems. The situation, described here by Smith in 1776, is one where once a nation goes through its rapid growth phase and its economy becomes more "mature" a point is reached where the wealthy owners have to establish an oppressive class monopoly in order to maintain large profits. This is a fact of capitalism, and as Smith points out, limiting free trade does not help to resolve the problem either. The problem that we have in America today is that the wealthy elite have used the failures of some of the efforts to implement alternatives to "American capitalism" as justification for the worst aspects of capitalism. Instead of our culture promoting an understanding of capitalism, its qualities and its problems, the mantra has simply been pounded home that any alternative is "evil," and if there is ever any doubt that this is true, fingers are simply pointed to Joseph Stalin and the Soviet Union or Fidel Castro in Cuba. Instead of promoting understanding and looking for alternatives that would truly benefit society and be fair to all people, the specter of failed "Socialist" efforts is used in the promotion of the idea that there are only two choices, either the way of the Soviet Union, or the way of the "USA" (which people always define according to their own platform). This all plays into the favor of those few elite property owners, the American capitalists. It is in the age of shepherds, in the second period of society, that the inequality of fortune first begins to take place, and introduces among men a degree of authority and subordination which could not possibly exist before. It thereby introduces some degree of that civil government which is indispensably necessary for its own preservation: and it seems to do this naturally, and even independent of the consideration of that necessity. The consideration of that necessity comes no doubt afterwards to contribute very much to maintain and secure that authority and subordination. The rich, in particular, are necessarily interested to support that order of things which can alone secure them in the possession of their own advantages. Men of inferior wealth combine to defend those of superior wealth in the possession of their property, in order that men of superior wealth may combine to defend them in the possession of theirs. All the inferior shepherds and herdsmen feel that the security of their own herds and flocks depends upon the security of those of the great shepherd or herdsman; that the maintenance of their lesser authority depends upon that of his greater authority, and that upon their subordination to him depends his power of keeping their inferiors in subordination to them. They constitute a sort of little nobility, who feel themselves interested to defend the property and to support the authority of their own little sovereign in order that he may be able to defend their property and to support their authority. Civil government, so far as it is instituted for the security of property, is in reality instituted for the defence of the rich against the poor, or of those who have some property against those who have none at all. 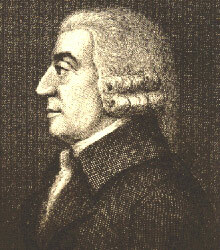 Adam Smith's desire was that his economic observations would lead to widespread ownership of property by all people who would fairly share in the fruits of socially created value. In reality high profits tend much more to raise the price of work than high wages. If in the linen manufacture, for example, the wages of the different working people; the flax-dressers, the spinners, the weavers, etc. should, all of them, be advanced two pence a day: it would be necessary to heighten the price of a piece of linen only by a number of two pences equal to the number of people that had been employed about it, multiplied by the number of days during which they had been so employed. That part of the price of the commodity which resolved itself into wages would, through all the different stages of the manufacture, rise only in arithmetical proportion to this rise of wages. But if the profits of all the different employers of those working people should be raised five percent, that part of the price of the commodity which resolved itself into profit, would, through all the different stages of the manufacture, rise in geometrical proportion to this rise of profit. The employer of the flax-dressers would in selling his flax require an additional five percent upon the whole value of the materials and wages which he advanced to his workmen. The employer of the spinners would require an additional five percent both upon the advanced price of the flax and upon the wages of the spinners. And the employer of the weavers would require a like five percent both upon the advanced price of the linen yarn and upon the wages of the weavers. In raising the price of commodities the rise of wages operates in the same manner as simple interest does in the accumulation of debt. The rise of profit operates like compound interest. Our merchants and master-manufacturers complain much of the bad effects of high wages in raising the price, and thereby lessening the sale of their goods both at home and abroad. They say nothing concerning the bad effects of high profits. They are silent with regard to the pernicious effects of their own gains. They complain only of those of other people. And, of course, we see the exact same excuses being used by capitalists today to justify the depressing of the minimum wage, which is currently lower than it was back in 1950. So, there should be no confusion about which side even the founders of capitalism were on. Smith, and men like him, were not out to promote the exploitation of populations for profit, they were out to document economic processes in order to better understand them so that economic principles could be better used to promote a fair and productive system, and that is exactly what we must continue to do today. So, based on the understanding of capitalism that I have outlined here, what can be done in order to improve our system, make it more equitable, more productive, and more resilient? Ensure that capital is more evenly distributed among all members of society. Reduce taxes on labor and increases taxes on capital. Increase the progressiveness of taxation. Charles E. Merrill, the founder of Merrill Lynch, claimed that his goal was to "bring Wall Street to Main Street". Merrill spoke highly of the need to democratize American stock ownership. In 1945 only 16% of American households owned some stock and today over 50% do. The goal of popular investment is obviously a good one. The majority of American stock ownership today is through pension plans, and despite the rise in the number of people who own at least some stock, stock ownership is still extremely concentrated in the hands of the top 1% as the graph below illustrates. As of 1998 79% of capital funds were owned by the top 10% of households. Stock represents a share of ownership in "capital," i.e. the means of production. Investing is a means of sharing ownership of the means of production, but it is a way that respects private property rights and allows individuals to share ownership of capital directly, instead of through a State system. The problem with investing as a tool for economic justice, however, is that you have to have money to invest, back to the ol' "it takes money to make money" scenario; in addition, as we have recently seen, the system is still not free from corruption. Nevertheless, investment markets provide an excellent framework for establishing economic justice. As Supreme Court Justice Louis Brandeis said: "We can have a democratic society or we can have great concentrated wealth in the hands of a few. We cannot have both." I firmly believe that we cannot have economic justice until every single American has an equitable share in investment markets. As it stands now ownership of capital is highly concentrated in the hands of the wealthy. There isn't any way to justify this or to claim that this is "a good thing". Its not a good thing, its unsafe for democracy, it leads to corruption, it creates economic instability, and its unfair given the fact that socially created wealth is realized by people who do not directly contribute to it simply because they hold a piece of paper that entitles them to it. The system though, the investment system of stocks, bonds, etc., can be a highly progressive tool if properly used by our society; not as just a means for a few people to get rich quick, but as a means to distribute socially created wealth equitably in a structured way that is respectful of property rights and which puts ownership of "the means of production" directly in the hands of the individual, not in the hands of the State. So, how would we go about doing this? My personal proposal would be to implement a Federal investment system. Though the Federal government would be involved, its role would be purely administrative in nature, similar to the way the Federal government administers the Social Security program, except the government would actually play an even smaller role and individuals would have direct control over their own assets, so they would be out of reach of politicians. A small flax tax could be implemented, which would be used to buy shares in a Federally held investment portfolio. The investment portfolio would contain only index funds. Every individual would have their own investment portfolio, and it would be just like an investment portfolio that people have now with private brokerage firms. In fact the actual holdings could be outsourced to private brokerages such as Vanguard. Shares in that portfolio would then be granted based on the number of hours that a person works. That means that everyone who works 40 hours a week would receive exactly the same number of shares. This would also greatly increase investing in American business as well, bringing more money into our investment system. What this would do is help people who would not ordinarily be able to invest get a real piece of the American pie. Poor and average Americans are never going to be able to "buy their way" into equality with the established giants of capital. There may a be a few examples of "average people" who make it big, but the system as a whole is never going to naturally move towards greater economic equality, it will always naturally move towards greater economic disparity. What has brought greater economic equality in America over the past 50 years has been FDR's New Deal program and government redistribution of wealth. The rise of the American middle class during the 1950s and 1960s was a product of government assistance, not of the free market. A system like what I am proposing would result in virtually all Americans being truly enfranchised, truly owning a piece of America. We know that ownership is one of the greatest things that motivates people to be better stewards of property. All you have to do is look at the difference between a neighborhood where people own homes compared to one where everyone is renting. Essentially everyone who does not own a share of capital in America is "renting" prosperity. If true ownership were more widely embraced by everyone then people would act more enfranchised because they would in fact be enfranchised and this would be reflected in society in the same manner that home ownership is reflected in society. Ultimately something of this nature will have to be implemented because of mechanization and automation. The ultimate goal for all of us is that we should all become true capitalists. We should all become people whose primary means of income comes through property ownership, not labor. That is ultimately what capitalism is about. Being able to live off of investments should not be a privilege that is exclusive only to the top 1% of Americans, and in global terms less that half a percent of global citizens. We must recognize that we should all be working towards a day when every person on earth is a "capitalist". This graph shows Gross Domestic Product produced per work hour in America over time. As you can see, by 1998 American workers were producing about 6 times as much "product" per hour as they were in 1910. That is to say that in 2 hours of work in 1998 the average "worker" produced as much "product" as was produced in 12 hours of work in 1910. You can see the link below the graph for more information about how this index is calculated. The graph below is an illustration of the concept of the increasing role of capital income in our economy. The graph shows a breakdown of the three major types of income in America, income from labor, capital, and transfer income (income from the government). The graph shows how we should expect of the role of each of these types of income to change over time under a system like I am proposing. Without an increase in capital ownership what you would expect to see is an increase in Transfer income, i.e. an increase in the Welfare State. The fact is that our system is continuing to develop in this direction, in the direction of a system where people are not needed for labor. There will come a day when we simply do not need human labor to produce the majority of goods. If people are required to work in order to be allowed to consume, yet we can produce the majority of goods with virtually no human labor, then how is anyone going to be able to buy the goods that we are capable of producing? Capitalism can solve this problem, but it can only be solved through true popular ownership. As we advance technologically, in order to truly make the system continue to work, the share of ownership in the means of production needs to be constantly increasing. Right now, the ability to buy into that system of ownership is the biggest hurdle that our society, and ultimately the world, faces. If we don't take action to ensure that capital ownership becomes increasingly democratic then the economic system will become limited, not by our ability to create, but instead by our lack of ability to consume, which will be limited purely by property rights. Demand will exist, means to supply it will exist, but legal ability to consume will not be able to keep pace with either production capacity or consumption demands. Understanding that property is the ultimate means through which value is realized naturally leads to the conclusion that it is property that should ultimately bear the greatest burden of taxation, especially if we are to be working towards a system that will continually decrease the need for labor. This has been recognized by many people, and it was in fact not until World War II and ultimately the adoption of Keynesian economic ideology, that anything different was ever considered in America. Even Andrew Mellon, Republican Secretary of the Treasury from 1921 to 1932, stated that capital should be taxed more highly than labor. Surely we can afford to make a distinction between the people whose only capital is their metal and physical energy and the people whose income is derived from investments. Such a distinction would mean much to millions of American workers and would be an added inspiration to the man who must provide a competence during his few productive years to care for himself and his family when his earnings capacity is at an end. Basically Mellon recognized that taxing labor more highly than profits from investments was highly unfair to those people who earned their money from day to day work, as others received money while they slept. It is certainly just to tax actual work less than or equal to profits on investments; in addition though, as our system evolves to become more efficient and more mechanized and the need for labor is reduced, what is happening is that workers are being replaced with machines, and every time that happens tax revenue is lost in terms of a share of GDP. In other words a smaller a smaller portion of GDP is being taxed because we are getting more GDP per worker through the replacement of workers with machines. As this happens, with a tax system that is based heavily on labor taxes, the tax burden is falling more and more on working class people, in addition to the changes in the tax brackets which themselves are also shifting the tax burden onto the middle class. Not only is taxing capital more highly than, or equal to, labor more fair at face value, but its all the more fair considering the facts presented: that labor is how value is created and property rights are the ultimate way in which value is realized. Without work, all capital is worthless. What this would mean is increasing corporate income taxes and capital gains taxes, while at the same time reducing payroll taxes overall. In fact Corporate income tax rates have been reduced dramatically over the past 20 years, representing one of the largest areas of tax cuts. In addition to those changes, the Social Security tax cap should be removed as well. The Social Security tax is currently capped at $87,000 which results in the highest burden in terms of the Social Security tax falling on those that earn under $87,000 in payroll income. How should these things be done? Through moderate transition. As capital income becomes a more significant portion of national income, taxation of capital should be slowly increased. It would have to be or else revenue would be lost. The validity of the concept of "flat taxation" is dependant on the existence of a 100% fair and equitable economic system. Our federal tax system has become increasingly flat since the the 1960s. The degree to which a taxation system should be progressive is always a subjective matter to a degree, however "flat" taxation can only be supported based on the idea that our economic system is 100% fair and equitable in the first place, and that all individuals receive the true measure of all of the value that they contribute to the system. ...National Government should impose a graduated inheritance tax, and, if possible, a graduated income tax. The man of great wealth owes a peculiar obligation to the State, because he derives special advantages from the mere existence of government. Not only should he recognize this obligation in the way he leads his daily life and in the way he earns and spends his money, but it should also be recognized by the way in which he pays for the protection the State gives him. To presume that a man receiving $30,000 a year and a man receiving $30,000,000 a year are both taking equal advantage of the fruits of society and the State is absurd at face value, and likewise to assume that the individual who is receiving $30 million is contributing to society 1,000 times more than the individual receiving $30,000 is also absurd. This would be to say that one CEO is more valuable to America than 1,000 school teachers. The issue goes well beyond that though. As I have shown above, much of the wealth which is realized by the wealthiest members of society is a product of socially created value, and thus the wealthy are, for the most part, receiving an "unfair" portion of the national income in the first place. The idea of flat taxation only makes sense if you assume that everyone is getting exactly their "fair share" in the first place, which they are not. As ownership of capital becomes more evenly distributed, then yes taxation can become less progressive, however, right now our underlying economic system is highly unjust and progressive taxation is a means to ensure greater economic justice. The "free trade" debate is currently gaining attention in America today, however the press is not covering this issue honestly. The debate is being framed as "free trade" versus "protectionism", when in fact those are not the real positions. The so-called "free traders," i.e. global corporations, are not really promoting free trade, they are promoting increased trade that is made cheaper for certain organizations with protections for those organizations to limit labor competition. The serious opponents to this so-called "free trade" are not "protectionists," they are people who would like to see "real" free trade, without all the special protections for big corporations. The problem with so called "free trade" is many fold. Free trade was originally viewed by its proponents as beneficial in its ability to exchange goods between regions in such a way as to share goods that people don't have access to locally. For example, in the 1600s, furs from North America were valued in Europe and China and Chinese silk was valued in North America and Europe so furs from North America would be traded for silks from China, etc. That is a case of exchanging goods that people don't have access to locally in order to supply demand. That's great. That is not what "free trade" is about today however. Today the goods being traded, by and large, are capable of being produced anywhere. In the 1600s the Chinese simply did not have beavers, and American colonists simply did not have silks. They had to trade in order for both people to get these things. Today we can build virtually anything in the world that can be built in America just as easily, if not more so, than it can be built anywhere else. We don't need to trade with China to get electronics, we can build electronics devices here. What is really being traded today is labor power. The biggest problem with so-called "free trade" is that what it ultimately does is make advancement of labor rights more difficult, and that is the real goal of this "free trade" movement as well, to hinder the advancement of labor rights. The way that this "free trade" hinders labor rights is that companies are seeking to make it easier to move their production from place to place so that if workers in any area begin to unionize or gain increases in the minimum wage, or if wages go up in an area due to normal market demands, the companies can then easily pickup shop and move to a new location. As they do this they can then constantly keep seeking the cheapest labor markets, which makes labor rights and advancements in quality of life more difficult because there is always the threat that the companies can simply move production to somewhere else. Another problem is that the US government and these companies have significantly more influence in many foreign countries than they have at home here in America. Money can be used in third world nations to influence policy and leadership. The US has a well documented history of supporting anti-labor leaders in many countries all over the world, places like Indonesia/East Timor, South Korea, Nicaragua, Chile, and Honduras just to name a few. This history goes back to the South America Banana Republics of the 1800s. So, when companies are moving jobs out of America and into some third world country, they are doing it because they have a greater degree of control over the labor markets there than they do in the United States. They hold more influence there, they can more easily bribe and persuade third world leaders and businessmen in these foreign countries than they can here in America. All of these major companies court government and business leaders in third would countries and build strong relationships with them so that those people are loyal to their interests, instead of them being loyal to the interests of their fellow citizens. Free trade is good, but free trade should be used to secure resources that we don't have access to. For example, if there is demand for pineapples and we can't grow them here, then yes we should import them from somewhere else. However, free trade should not be used as way to simply empower corrupt regimes to benefit themselves at the expense of their own people in order to provide higher profits to American companies. If that is what is going on, that is essentially American slavery all over again, and the fact is, that is what is going on. Therefore, trade between the United States and foreign countries should come with conditions. It should come with the conditions that workers must be fairly paid, they must have basic human labor rights, they must be allowed to independently unionize, they must have safe work environments, and some basic environmental regulations must be obeyed. In addition, American citizens need to be well informed on the nature of these conditions in any trade agreement. American citizens need to be well informed on how these companies really conduct themselves in foreign countries. The fact is that labor power exists in all countries and so labor power is not something that really "needs" to be traded. Labor power is only traded as a means to increase profits of a few at the expense of the many, not as a means to satisfy demands, which is the real purpose of free trade. Ultimately we should be moving towards the implementation of global minimum wages and basic global labor standards. Trade can become America's greatest weapon to truly spread democracy and freedom to the world. Look at how much money we spend on the military. We can use trade to improve the living conditions of people all over the world if we want to, however for the past 50 years the opposite has been going on. We have been using pressure to keep living conditions depressed in many countries in order to provide cheap labor. That is exactly where the tension in this world is coming from. If we use trade responsibly, and require American companies to be globally responsible, we can benefit not only ourselves, but all of humanity. Capitalism is all about property rights and ownership. As individuals, we all need to be conscious of that and the real implications of what that means. In order for the capitalist system to be fair, equitable, and functioning well, it also requires that everyone understand the role of capital in the economy. The more widely distributed ownership of capital is the more fair the system is and the better the system functions, yet the tendency in capitalist systems is for ownership of capital to become consolidated. As progress is made so that mechanization and computerization account for a larger and larger portion of the manufacture of goods and services it becomes increasingly important for all citizens to share ownership of capital. We are all contributing to the value of capital, yet only owners of capital realize that value, therefore everyone who is not an owner of capital is losing out on value that they themselves are contributing to our economic system. Investing provides an excellent means to share ownership of capital, however, due to the fact that it requires money to buy into the investment system, and due to the fact that we are all contributing to the value of capital, it would be a great justice to find some other means to distribute capital to more people. In addition to the issue of "fairness", economic principles dictate that if ownership of capital is not more evenly distributed then our economy will become limited by the needs of laborers instead of by our social potential to produce. Therefore it is ultimately in everyone's best interest that ownership of capital be more evenly distributed.